Over the course of a dietetic internship, there is a gigantic list of competencies that dietetic interns must meet and demonstrate. For our foodservice rotations, like at Lambeth House, we must prove our competence in different human resources roles. One of these is educating employees, which we prove by putting on an in service education session for the employees. The topic that Rebecca, Erin, and I chose for the talk was proper meat storage: why it’s important, how to properly store meat, using the FIFO method, and labeling. The employees were actually really interested, so I thought I’d share the information here as well! Proper meat storage is essential because meats are more commonly contaminated with harmful bacteria than vegetables are, which makes storage especially important. Meat comes from animals, and living animals have symbiotic relationships with a bunch of different organisms that can make us sick if we end up eating them. These organisms are killed during cooking, but if meat is stored improperly they could end up on foods that don’t get cooked, like vegetables. Knowing how to store your meat is important to prevent this sort of cross contamination. Additionally, the higher fat content of meats can cause rancidity if stored too long, and that is something that nobody wants to have to deal with. 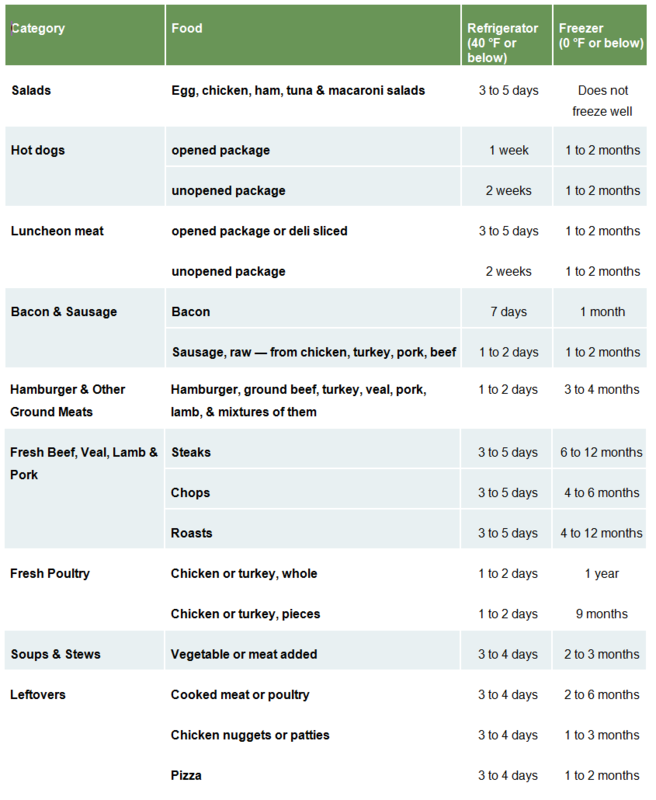 Some of these are surprising for a lot of people – just 1-2 days for chicken then it NEEDS to go into the freezer! Stands for first in first out and is mostly used in commercial kitchens, but you can follow the same principles at home. When you purchase more of a food item that you already have some of at home, you should use the older stuff first to minimize waste and avoid keeping things around for too long. I do this all the time because I have a paralyzing fear of running out of Chobani plain 0%. Open the oldest one first! Labeling is widely used at restaurants and other large foodservice operations, but often people overlook this at home (myself included). Labeling containers with the date that you made something helps to ensure that you finish up those leftovers within 3-4 days, and can tell you at a glance whether the lentil soup you just dug out of the back of the freezer is still edible. Which numbers surprised you the most? This entry was posted in Dietetic Internship, Nutrition and tagged dietetic internship, food safety, Food Service, human resources, in service, Lambeth House, meat storage. Bookmark the permalink.